This 25-slide presentation introduces Ginstr, a flexible and customisable NFC-based tool for real-time monitoring of mobile operations, assets and workers for compliance, reporting and proof of presence. Ginstr is a customisable turnkey system that can be used to replace paper forms and antiquated workflows with custom single- or multi-page apps for use cases as diverse as time recording, cleaning, facility management, chain-of-custody, attendance, library management, guard tours, and asset inspections. Because every customer has different requirements and nobody wants to change their processes to fit an off-the-shelf solution, Ginstr’s Android framework allows for rapid development and customisation and a typical app can be created in less than one working day, the company says. Custom apps can be anything from simple paper form replacements to multi-page apps with business logic. For data acquisition Ginstr can work with NFC wristbands, tags and cards, as well as barcodes, QR codes, BLE, WiFi, GPS and more. 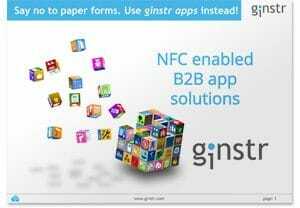 ‘Meet Ginstr: NFC Enabled B2B App Solutions’ has been produced and sponsored by Ginstr and approved by the NFC World editorial team. This 25-slide presentation is available free of charge to NFC World Knowledge Centre members (PDF format, 2.6MB).